HAVANA, Cuba, Oct. 26, 2017 /CNW/ - Habanos, S.A will introduce its latest release at the 35th Edition of the Havana International Fair (FIHAV 2017): the new Línea Retro, presented through two products, Partagás Capitols and Romeo y Julieta Club Kings. This appealing and modern-day proposal for consumers also boasts an unmistakeable retro charm design. The new Línea Retro stands out for its metal box presentation. An attractive design inspired by the original pocket cigar holders that became so popular in the seventies. Nowadays, these pieces are highly-valued and sought after by collectors. 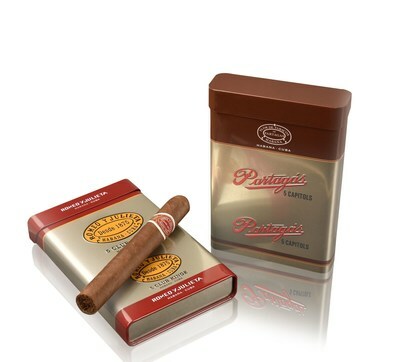 The Partagás Capitols and Romeo y Julieta Club Kings cigar cases feature a technical design developed exclusively for Habanos, S.A. that will solely be used for the Línea Retro product launches. Each case holds 5 Habanos, with the vitola de galera Mareva (42 ring gauge x 129 mm length). Mareva is possibly the most popular format in the history of Habanos, and its dimensions have been for a long time considered the "standard" size versus other formats. With Partagás Capitols, the brand Partagás introduces again the Mareva to the brand's regular portfolio. The Línea Retro joins the Habanos portfolio with the aim of gradually introducing this same concept to other brands. FIHAV is, since 1983, Cuba's most important multi-sector trade. The event will run this year from October 30th to November 3rd at the EXPOCUBA exhibition centre. Habanos S.A. will have a spacious stand in the Central Pavilion. As well as the Línea Retro, with Partagás Capitols and Romeo y Julieta Club Kings, Habanos, S.A. will also showcase during the fair many other iconic and renowned vitolas and new launches presented in 2017. Among this year's major releases highlight the following: H. Upmann Sir Winston Gran Reserva 2011, Línea 1935 de Montecristo, with three vitolas: Maltés (53 x 153 mm), Dumas (49 x 130 mm), and Leyenda (55 x 165 mm). The first two unprecedented in the brand; Quai D'Orsay and the new vitolas: No. 50 (50 x 110 mm) and No. 54 (54 x 140 mm), the new Romeo y Julieta Petit Royales (47 x 95 mm); the 2017 limited editions: Cohiba Talismán (54 x 154 mm), Partagás Series No. 1 (52 x 138 mm) and Punch Regios de Punch (49 x 120 mm). There will be also present the new releases for La Casa del Habano and for Habanos Specialists: Trinidad La Trova (52 x 166 mm) and H. Upmann Connoisseur B (54 x 150 mm).